The Regional Approach to Competitive Airfare. A regional partnership has been formed to enhance low-fare air service to the Knoxville-Oak Ridge Innovation Valley region. 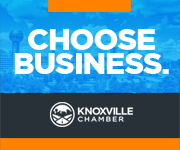 The Competitive Airfare Partnership, which currently includes the City of Knoxville, Blount County, Knox County, Innovation Valley, Visit Knoxville and the Knoxville Chamber, is a public/private initiative with a fundraising goal of $3 million. To date, $2 million has been committed to the initiative. These funds will not only assist in recruitment efforts but also in developing a long term communication strategy to garner support from the business community for low fare service. Learn more about the Competitive Airfare Partnership by visiting the Innovation Valley website.